Phường Cửa Nam, Quận Hoàn Kiếm, Hà Nội. Fragmentation of Production and foreign investment by global Multinationals have played a major role in the formation of regional production networks increasing the flows of trade in intermediate goods among nations and fostering local procurement in the host countries. From the point of view of the host country, this flow of investment can be an opportunity for Small and Medium Enterprises （SMEs） to join the global chains of production and become more competitive. Mexico and Thailand had become, in their respective regions, ma jor players in the automotive industry network and Japanese investment has played an important role in this outcome. This paper looks at t he impact of Japanese FDI in the formation of such networks. Wil de Jong, Gerardo Mery, ed. TENDENCIAS POLÍTICAS ACTUALES EN LOS PAÍSES ANDINOS. Discussion Paper No.4 is now available as following publication. For the details, please click here. Islam at the Margins:The Muslims of Indochina. OMAR FAROUK, Hiroyuki Yamamoto ed. Después del Consenso de Washington:dinámica de cambios político-económicos y administración de recursos naturales en los países andinos. 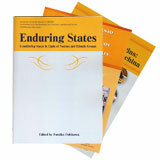 Enduring States:Considering States in Light of Nations and Ethnic Groups.